The first thing that stands out when picking up a copy of the Crossbill Guides Andalusian Sierras, is the heavy paper, and full colour photos and maps. The quality of the paper makes a huge difference to your enjoyment of this guide, which should accompany you in the car. Buy a second copy to keep on the coffee table, for easy reading at home. At 208 pages, this is a meaty guide that is also only slightly wider than a paperback novel, and very easily fits in a daypack when you’re walking or hiking around the district. Though district might be too localised a description, since the area covered in Andalusian Sierras stretches from the Bay of Gibraltar, through the Alcornacales, Grazalema, Sierra de las Nieves, Torcal and Ardales-El Chorro parklands. Visitors to the area are often struck by the contrasts between differing parts of Western Andalucia, that in such a small geographical area there can be so many ecosystems bordering each other. The terrain is unique in being the meeting ground where Africa is pushing into Europe, with high limestone mountains, rolling sandstone hills, and low fertile valleys. Needless to say, the flora and fauna of the area can differ quite substantially. In Andalusian Sierras we are first introduced to the landscape, written in an appealing descriptive style, and heavy on facts. Climate and geology is discussed first, and includes schematics of the terrain explaining the various habitats to be found. 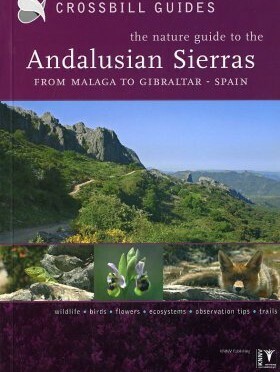 For the infrequent visitor to Andalucia, a book with 30 walks of the Serrania de Ronda is useless. Far batter to invest in Andalusian Sierras: From Malaga to Gibraltar (Crossbill Guides) with 14 excellent walks covering a wider area, that take in a broader variety of habitats. The majority of visitors to Andalusia are after all, only here for a week or two, and it would be a shame to not experience El Torcal, Grazalema, or the lowland walks of the Campo de Gibraltar near Tarifa. Nature lovers who travel the world in search of new experiences will thoroughly enjoy the treatment of the the natural spaces in Andalusia by the Crossbill Guides Foundation. Whilst this guide only covers the nature of Malaga and Cadiz provinces, anyone familiar with the district would confirm that the native and migratory flora is amongst the richest in Europe. Pages are colour-coded, and roughly divided into four sections, Landscape, Flora and Fauna, Walking Routes, and Tourist Information and Observation Tips. The walking routes are graded, include a map, description of terrain, colour photos of highlights, and itinerary. The routes are; bird Migration along the Strait of Gibraltar, the Southern Alcornacales, the Northern Alcornacales, Climbing Aljibe Mountain, El Pinsapar Spanish Fir forest walk, Salto del Cabrero, La Garganta Verde, Along El Bosque river, the north slope of the Pinar mountains, the karst landscape of Villaluenga, the fir forest of Luis Ceballos, the hight mountains, El Chorro, and walking in the Torcal de Antequera. The back of the book gives a species list for plants, mammals, birds, invertebrates, and reptiles. Curiously, the editors have decided to provide English, Latin, German, and Dutch, but not Spanish. This isn’t a huge oversight, but does mean when speaking to Spaniards about fauna and flora, you’ll need to use the latin name to find common ground.